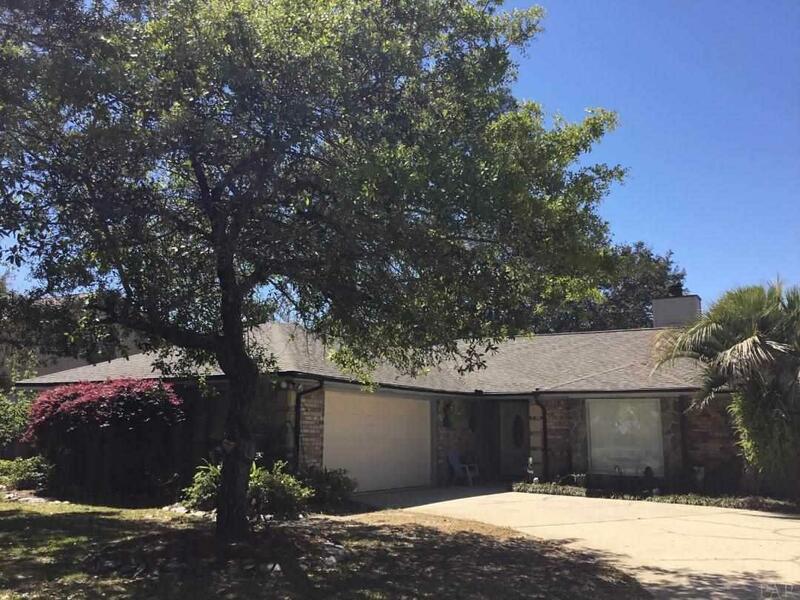 Cul-de-sac neighborhood, all brick 3/2 home with backyard paradise; in ground pool with jetted seats, covered patio, Tiki hut, Florida room with blinds, tiled floors & window unit looking out to large oak trees on one side and sunny on pool side of home. Split floor plan with large master suite, 2 walk in closets, jetted tub, shower, double storage closet and private exit to Florida room and pool area. Kitchen has large breakfast bar, custom cabinets to ceiling, built in pantry and extra storage closet shared with dining area for table and cabinet. Two bedrooms share a large vanity and bathroom. Wood burning fireplace has storage closets on both sides and beautiful stone face. The ceilings are textured (no popcorn) and tile or wood like laminate in all rooms (no carpet). Large laundry room with linen closet and extra large garage with wind fortified garage doors. House was upgraded to wind mitigation qualifications by Rebuild NW FL, New HVAC with heat pump and new water heater. Seller to give credit or allowance for a new pool liner of buyer&apos;s selection. House is covered with annual termite bond. Home is in Gulf Breeze school district and convenient to Pensacola Beach.